You’re going to climb the Everest and suddenly you realize you don’t want to die so young… and the plane departs in 10 minutes! What do you do now? Don’t worry, take that flight cause your friends of Trip and Travel know how to suggest you the best experiences to enjoy Nepal while seeing Everest from far! 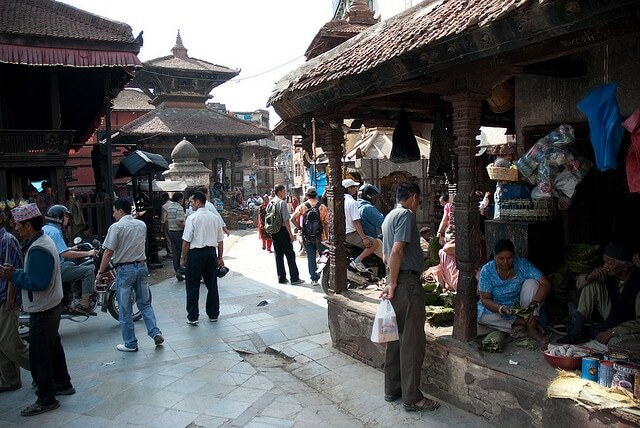 This neighborhood is the most touristic of all in Kathmandu. This is where most travelers stay and where the largest range of accommodation, restaurants and shops to buy a little of everything are found, a must to experience the chaos and energy this city releases. The Basantapur square, or Durbar square, is located in front of the ancient royal palace in Kathmandu (Hanuman Dhoka), a World Heritage. For its beauty is one of the most famous places in the city. During the sunset it’s one of the best times to visit this emblematic temple. It’s an ancient religious temple located high on a hill on the west of Kathmandu city. As the name says there are usually many monkeys inside, which are considered sacred, and it occupies a central position in the Tibetan Buddhist. To visit it you’ll have to climb 365 steps, but … what is it for someone willing to do trekking in the Himalayas? Or you didn’t come to Nepal for that? 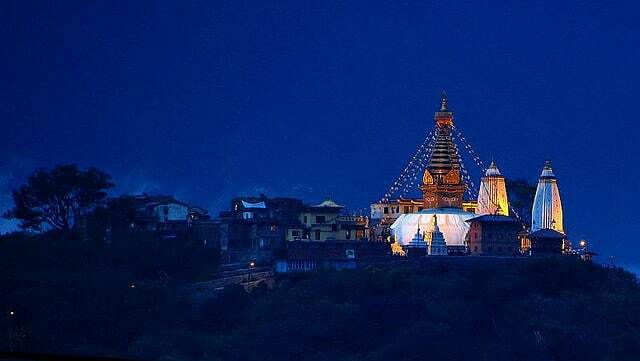 It is the largest spherical stupa in Nepal and the holiest place in the country, along with Swayambhu. It’s located about 11 km from the Thammel district and you can get there by taking a bus line from Ratnaparko or a taxi for about 3 euros. For those who don’t mind up getting up early, every morning at 7 there’s a ritual in which people walk three or more times around the stupa as the famous Om Mani Padme Um mantra is repeated and paint pots are spilled inside. Near the temple you can reach Pashupatinath, a Hindu temple where you can watch the cremation of the dead (something that will cause a great culture shock). It’s located at the entrance of Thammel. 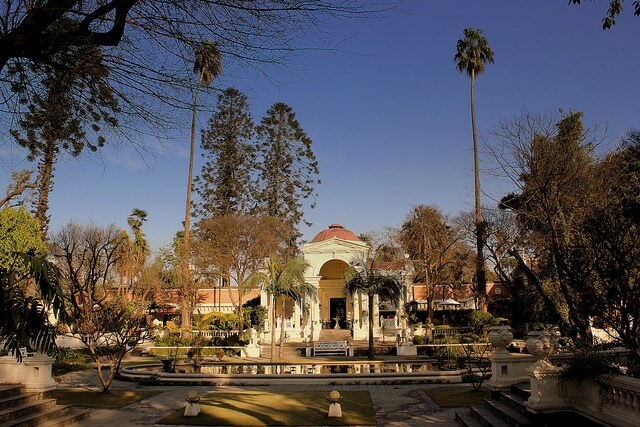 It’s a fairly large garden ideal for a break from the bustling activity of the city amongst its beautiful green spaces. A good place to relax or hike after having been walking through the alleys of Thammel. Admission is only 250 rupees (approximately 2 euros). Something not to be missed is the different taste typical dishes of Nepali culture. The most typical are: the traditional Dal Bath (cooked rice, lentil soup, vegetables and potatoes) that, as you will realize, is what basically Nepalis always eat; or also the momos (also called gyoza or dumplings) with different shapes and ingredients, the rotis (a kind of bread) cooked by kilns artisans and the different vegetables curries, potatoes, cheese, etc (Aloo Gobi, Aloomutter, etc) typical of Indian cuisine. It is one of the largest green spaces in Kathmandu. It was built for children and is named Ratna, the second wife of King Mahendra. Inside you can see many young people practicing the country’s favorite sport, cricket. Photos: Jesper Sachmann, calflier001, Bipin Parajuli and Natraj Trekking.